Anyway. This one is a product of a sleepless night. 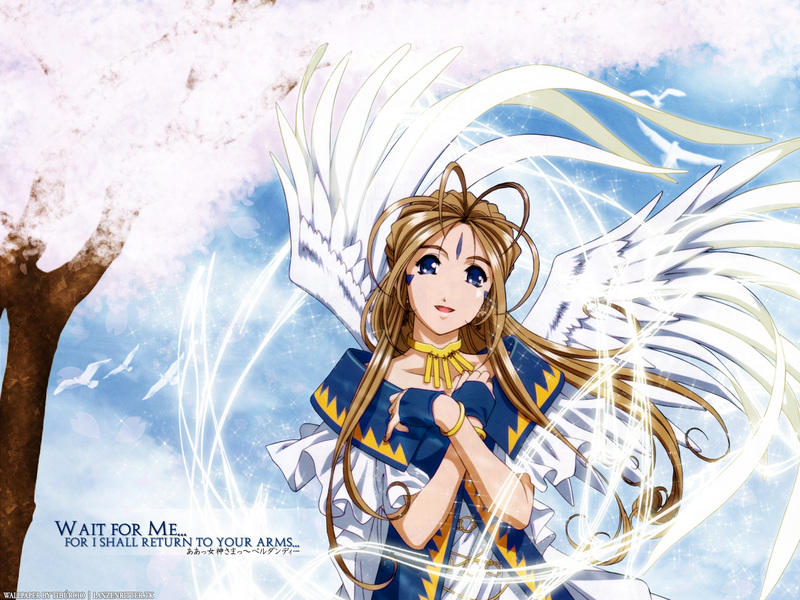 It features new-tv-series Belldandy. Scan from here. Stock photo from Morguefile. 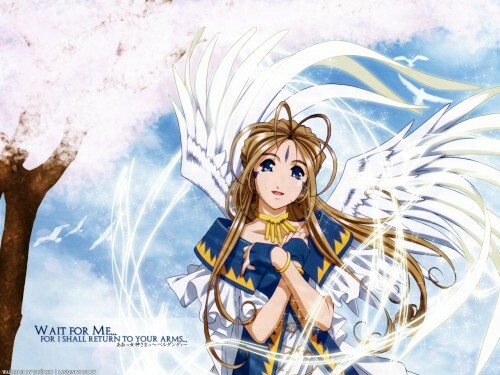 Never seen this image of Belldandy before - I like it a lot. The Sakura Tree is really well done, nice and light as well as somewhat fluffy in nature (xd). The glowing streaks going around her really add to the angelic atmosphere she herself puts out... the birds are perfectly placed, seemingly natural. Most of the time birds are thrown in randomly, not in this case. The type is great as well, especially the little Japanese characters below it. I like the little white transparent background you put behind the type as well. It adds some style. I've seen the firts ep, I thought it was great. I hope to see more lovely belldandy walls. the sakura tree is awsome! So beautiful ^_^ This wallpaper is so pretty and well done that it shall be on my desktop from now ^^ The strands of light look kickass and really suit the scan. The background setting is absolutely the best choice for a AMG wall. ah! megumiesama... isnt it... or...? Ah, Belldandy--it's nearly impossible to do anything with Belldandy without the result being pretty. Nice placement of the goddess with respect to the tree. this is a really nice Ah My Goddess wallpaper... not too many of those around <_< good work. the sakura tree and the sky is absolutely beautiful..
Nice scan my friend lensterknight! Good job!!! Well the tree looks very well indeed so I think you're getting there. Interesting is the position of the angel since her gaze takes you away from the center of wall... actually if you don't look atentively you could miss the seagulls in the back between the tree and the angel. Question: Have you tried reversing the situation, with the tree and gulls on the right side and the girl a bit onto the left? It could help the composition I think. Beautiful, it seems after the launch of the new TV series there have been more Ah My Goddess pics lately and i for one am happy! many thanks and appreciation for sharing with us! ulalalala....I LUV oh!my goddness!! This wallpaper is great! Beautiful!!! !